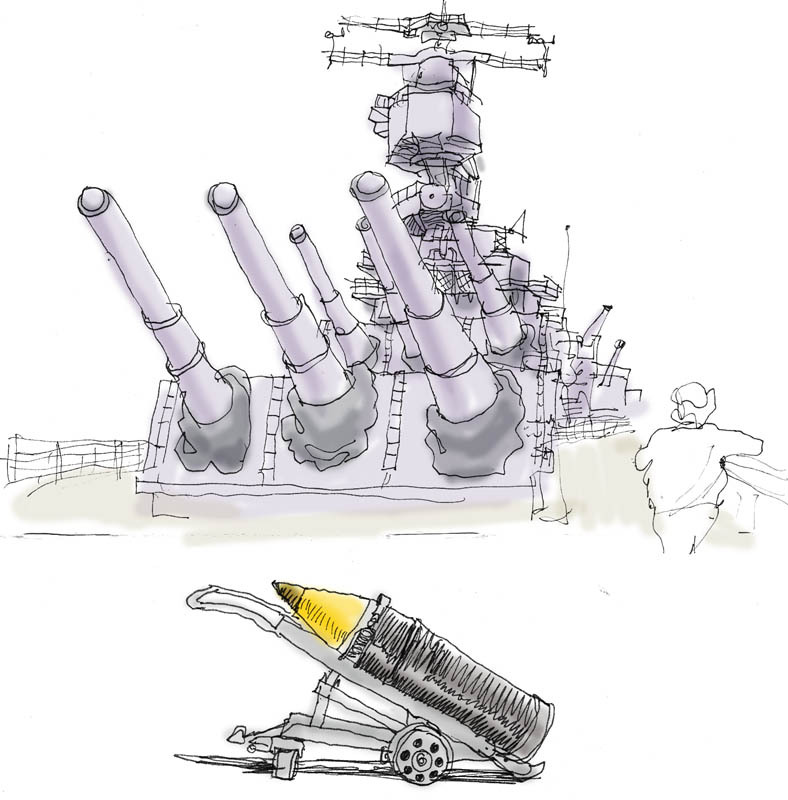 This is the USS Wisconsin, a battleship that protects Norfolk against unruly tourists, like if one is getting a ticket for parking in a loading zone and he's not loading? And he's yelling at the meter maid? So she gets on the radio and pretends she's talking to the Wisconsin, and she starts calling in coordinates, and man that tourist shuts his yap right away! By the way, that picture on the bottom that looks like a pencil? That is not a pencil. You don't want to treat that like a pencil. Like don't try to write with it. And for Sweet Jesus' sake, don't try to sharpen it. 'Cause you know how the pen is mightier than the sword? Well, this pencil is mightier than the pen and the sword put together! Much much mightier. Hundreds of thousands of times mightier. Even more, maybe. We might be getting into six figures here. So don't even think about writing with it. Hey, but you can use the eraser. Yeah, it would make a good eraser. Ha! Hey, Saddam baby, we got an eraser for ya! Oh wait, he's been caught. They found him in a spider hole. If they ever have a poll about what's the funniest new phrase of the decade, I'm going to vote for "spider hole". Um. Am I still on topic? I don't remember.